This pattern requires dropping some stitches (see row 6 of pattern below). You may be thinking, "Omigosh, are you crazy?!" Relax. The stitches aren't going anywhere. Really! And if you feel like one of them is trying to get away, just give the stitch a good tug. Or alternatively, you can clip on one of those split ring stitch markers or one of those other clip-on style stitch markers so those dropped stitches don't get "lost". See Notes section below before starting. Using ww cotton yarn, and US7 (4.5mm) needles, cast on 46 stitches. Repeat Rows 1 to 6, seven times. Bind off and weave ends. It's probably unconventional, however, I have used dashes to group some sections for ease of readability. Let me know if you think this is more confusing, and perhaps I'll edit this and make it more "standard" looking. LSC = Drop the 1st slipped stitch to front of work. Slip the next 2 purl stitches to right needle. Drop the 2nd slipped stitch to front of work. Then slip the 2 purl stitches from right needle to left needle. Then pick up the 2nd dropped stitch with your left needle and knit it. Then purl 2 stitches. 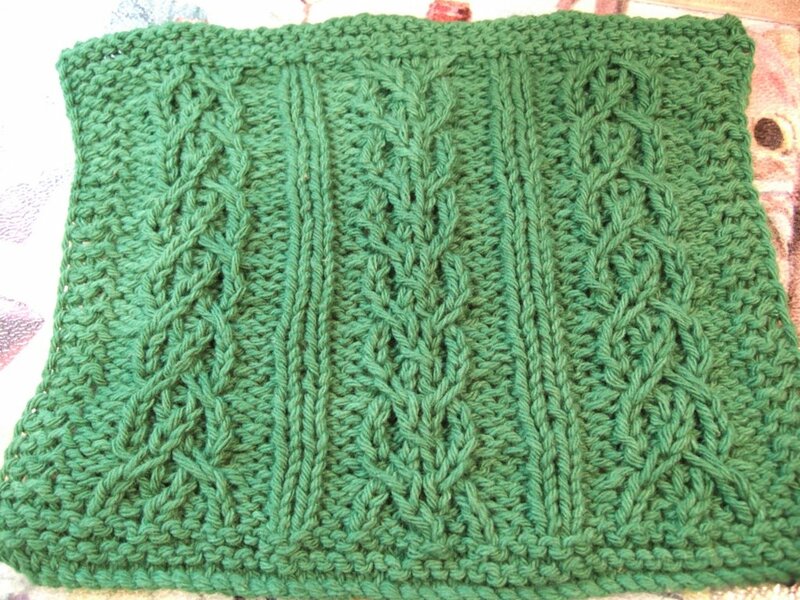 Then with left needle pick up the 1st dropped stitch and knit it. RSC = Drop the 1st slipped stitch to front of work. Slip the next 2 purl stitches to right needle. Drop the 2nd slipped stitch to front of work. Then with left needle, pick up 1st dropped stitch, then slip the 2 purl stitches from right needle to left needle, then with right needle pick up the 2nd dropped stitch and place it on the left needle. Then K1, P2, K1 across these 4 stitches. Sl1 wyib = Slip 1 stitch, with yarn in back. Sl1 wyif = Slip 1 stitch, with yarn in front. Sl2 wyib = Slip 2 stitches, with yarn in back. Sl2 wyif = Slip 2 stitches, with yarn in front. 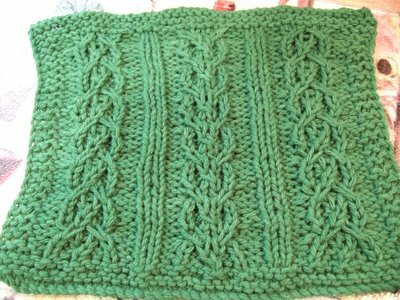 If you only want a one knit wide column between the three cables (instead of the 2 knit wide column in the cloth pictured above), just cast on 44 stitches and change the italicized K2 to K1 and italicized P2 to P1. I love your dishcloth! Thanks for sharing the pattern . 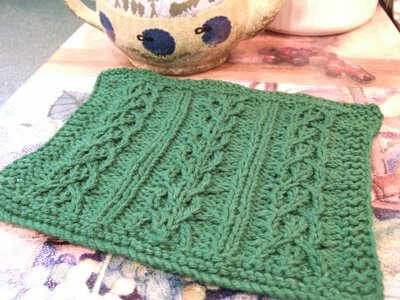 I thought I'd give this pattern a try before tackling your Persephone scarf. Instead of working it up as a dishcloth, I'm doing it as a scarf using some yarn left over from another project. Kind of slow going, but it looks really nice and I'm finally getting the pattern into my head( after three repeats! Yeesh!). Thanks for all the wonderful patterns, your blog is one of my favorite knitting websites.